*There are no scratches or dents on the top. *The fabric inside is clean and unused. *This will be an excellent addition to your gear, all clips and adjusters function as they should. 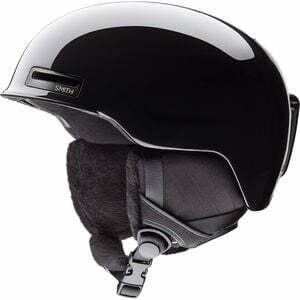 Half charisma, half cranium conservationâ€”as the world's lightest certified snow helmet, Smith's Allure Helmet has cushy comfort combined with unparalleled performance. Outfitted with an ultra cozy fleeced tricot lining, this sleek helmet has a streamlined style ideal for slashing through clean, trackless snow or trumping through mogul-land. The lightweight in-mold construction combines a polished PC shell with the protective EPS liner, making for top-notch protection without the clunk. Built with nine vents, AirEvac2 technology and the adjustable, easy-to-use Airflow system, this temperature regulator permits effortless modifications at the touch of a gloved hand. The self-adjusting lifestyle fit system consists of a forgiving elastic and flexes around the natural shape of your belfry for ultimate comfort while you're cruising.